Christmas Cafes, by Alan Powdrill. Christmas ornaments carved into skulls. So posting shelfies is a thing now, and here's one of mine. 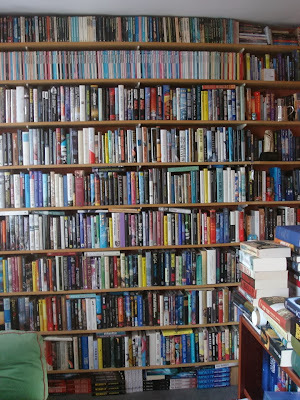 It shows part of my collection of hardbacks and, to the far right and on the floor underneath the bottom shelf, some of my own books, as well as a run of The Magazine of Fantasy and Science Fiction and about two metres of paperback anthologies. There are other shelves, of course. The bookcase at the right of the photo mostly contains books about science fiction. In the office, there are also six shelves of double-stacked fiction paperbacks, a couple of shelves of science books and a shelf of oversized books. Not to mention three shelves of books about London, New York and Los Angeles. 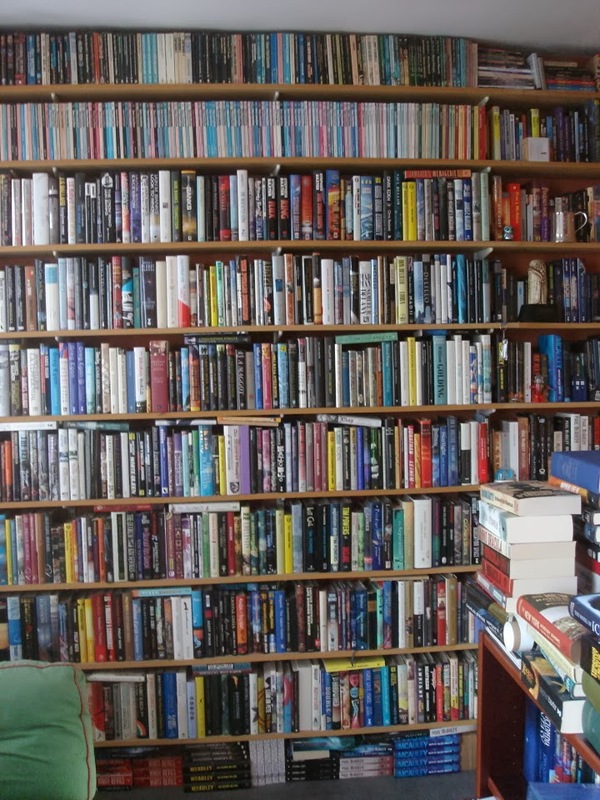 And then there are the books on the floor of the office, and the rest of the fiction paperbacks in a built-in bookcase on the landing, and the bookshelves in the living room where, amongst others, the graphic novels and books about music and films reside. But any picture that somehow managed to include all the books in the house (including those in the kitchen, which aren't all cook books, and the various caches of books in the bedroom) would only be a snapshot of single moment in a dynamic ecology. Like universes, book collections expand, contract, or (like mine) achieve a kind of equilibrium. Books arrive at a slower rate than when I used to regularly review for Interzone (one American publisher used to send me a mailsack stuffed with books every other month), but still they come. At first, they lodge on top of a blanket chest in the office (which also, now I think of it, contains some books on biology left over from my academic career), or on top of the bookcase in the photo. Some are read in the office; others flow downstairs to be read. And then they either leave the house for a charity shop or the tender mercy of a book dealer, or return to the top of the bookcase, where a couple of stacks await proper shelving. Anything that makes the shelves must first dislodge something already there; because there's no room for extra books, there has to be a strict one-in-one-out policy. Once there, they might last five or ten years before I decide that I'm never going to get around to rereading (or re-reading) them and weed them out, or they might become part of the permanent collection. The books that I know I can't ever bear to part with. The sedimentary bedrock whose deepest layer is almost fifty years old now. Sooner or later, all book collectors become librarians of their own lives. I first discovered J.P. Martin's Uncle books in the late 1960s, in my local library. I was an introverted teenager with a bad reading habit (I spent one rainy fortnight in Bognor Regis reading through about six feet of UFO books in the library - there must have been some serious UFO watchers, in Bognor). I had read everything on the science fiction shelves, and had begun to mine the rest of the adult fiction stacks, picking up whatever hooked my interest, from Beryl Bainbridge and John Updike to Angela Carter and Richard Brautigan. And these odd books with an elephant in a purple dressing-gown on the cover, apparently written for children but shelved with Thomas Mann and Carson McCullers. Maybe a librarian decided that they were too subversive for children; or (I hope) maybe she thought that adults shouldn't miss out on the fun, and ordered two sets. But by whatever means, it was my great good luck that they ended up there, for here was an antic world that fully engaged the imagination, a kind of cross between Mervyn Peake's Gormenghast, P.G. Wodehouse's Jeeves and Wooster novels, and The Goon Show. ...try to think of about a hundred skyscrapers all joined together and surrounded by a moat with a drawbridge over it, and you'll get some idea of it. The towers are of many colours, and there are bathing pools and garden among them, also switchback railways running from tower to tower, and water-chutes from top to bottom. Many dwarfs live in the top storeys. They pay rent to Uncle every Saturday. It's only a farthing a week, but it mounts up when there are thousands of dwarfs. A slingshot from Homestead's moat is a shantytown, Badfort, where Uncle's rivals guzzle Black Tom and constantly plot his downfall and humiliation. There's also a vast department store close by (possibly modelled on London's lost bazaar, Gamages), where everything is fantastically cheap, and a rival store where the unwary pay equally fantastic high prices. In this pocket universe of vivid contrasts, Uncle is a kind of benevolent dictator who isn't quite as bright as he likes to think he is (despite his BA). He's also something of a snob, but he engages the reader's sympathy because his considerable dignity and boldness is undercut by unexpected reversals and undeserved pratfalls and humiliations during his wars of attrition with his rivals in the shanty town of Badfort. It's a comedy of embarrassment and exasperation akin to Laurel and Hardy. The first Uncle book I read, Uncle and the Treacle Trouble, was the fourth in the series; I immediately doubled back and read the other three, captivated by the surreal deadpan humour and the richness of Martin's imagined world, full of unmapped mysteries and underpinned by a zany logic. Somehow (probably because I left for university) I missed the last in the series, Uncle and the Battle for Badgertown, and while I kept an eye out for secondhand volumes they seemed to never turn up, and now first editions go for impressively high prices. The Uncle books are scarce, and there are a lot of Uncle fans, including a good number in the SF/F field. Although the first two books were recently reissued by the New York Review of Books in nice hardbacks, the others have long been out of print.